CHICAGO – In a parallel universe, perhaps a version of “MacGruber” exists that actually understands that comedy should be funny…oh what a beautiful world that would be. Here in this astral plane Will Forte, Kristen Wiig, Ryan Phillippe and Val Kilmer, plus the writers, director and craft services obviously conspired to create a movie bomb that no one could diffuse. MacGruber (Will Forte) is an ex-military man with 17 Purple Hearts, 6 Congressional Medals of Honor and a reputation for mission impossible. His death was faked at the same time his fiancée Casey (Maya Rudolph) was killed at their wedding. The murderer was his arch nemesis Dieter Von Cunth (Val Kilmer, at his most ignominious), who in the present has captured a nuclear device with the intention of using it on Washington. With no where else to turn, Col. James Faith (Powers Boothe) searches a remote outpost for the incognito MacGruber, who seems to be a monk of some sort. Col. 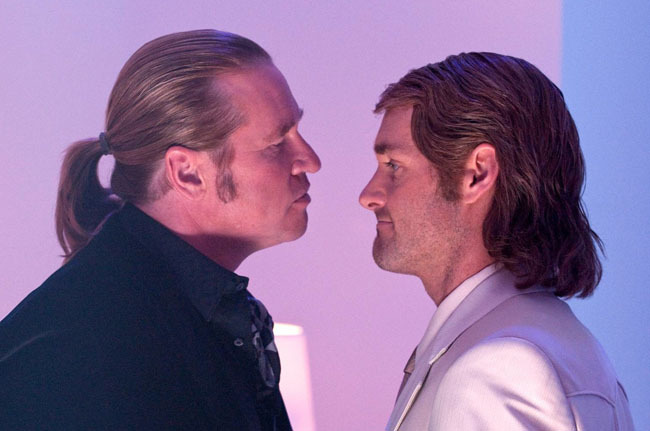 Faith cannot convince his elusive ex-operative to join the mission, but a dream of his dead wife convinces MacGruber that he must get back in the hunt for Von Cunth. With the help of Lt. Dixon Piper (Ryan Phillippe) and former aide-de-camp Vicki St. Elmo (Kristen Wiig), MacGruber will save the day with his mullet, flannel shirt and penchant for using ordinary items to create and/or diffuse weaponry. Except when he doesn’t use these items, which is oddly most of the film.